The team is holding a mock trial to prep Cabe for court. Cabe gets worked up after Walt rips him apart on the stand. Sly is nervous. The trial is in a few days. Cabe yells at Walt. Where are his bananas? He put them on the list and Walt went shopping. Happy takes a call. Search and Rescue needs the team to come out and move large boulders that are blocking an emergency road. There is a storm coming to they need all roads to be clear. Sly and Cabe stay back to prep for Cabe’s trial. A ding sounds. Sly announces his tea is ready. He runs to the computer. Cabe follows. Sly has been hiding what he and Walt have been up to. They built a supercomputer and they have been looking for Collins. The ding signifies that they have a lead. Meanwhile, the team is ready to wrap up the job and go when a plane flies overhead. It runs into the mountainside. Whoever it needs help. They rush to the see and find a father and his unconscious daughter whose leg is bleeding and broken. The man lost control of the plane. They only had 1 chute so he had his son jump. He needs the gang to locate his son. Sly does his magical math and narrows down the location. Walt and Paige take a walk with the father. They see the chute in the trees. He pulls the chord just as Paige tells him not to. A bag of money falls. It hits the ground. The man pulls a gun on Walt and Paige. He wasn’t looking for his son, but his money. The man ties up Walt and Paige and makes them walk ahead of him at gunpoint. Meanwhile, the daughter has come to and has Toby and Happy at gunpoint too. She has forced them into the van and is making them tie one another up. Walt and Paige pretend to be tired to they take a break. The man calls his daughter. They jump over a cliff and drag him with them. He skids to the top as they hang over the side. There is a short drop. The rope snaps and brings down Walt and Paige as well as some boulders. They are trapped. Sly and Walt go on the road to follow up on the lead to find Collins. He is supposed to meet what appears to be his mother at a nursing home. They arrive there but he isn’t there. Outside Sly gets a call. Cabe’s bank records are being subpoenaed. He received a wire transfer from Collins for $50k making it look like Cabe was in on his escape. Collins is setting him up. Toby and Happy outsmart the daughter and turn the gun on her. They tie her up and head to rescue Walt and Paige. Their only problem – they need to avoid the father who is headed their way. Cabe is furious. He wants to find Collins and beat him within an inch of his life. Sly brings him back down to reality. Collins beat them and now their only shot is in court. Toby gets to Walt and Paige. Happy didn’t want to leave the daughter behind because she was in pain. Walt straps the winch to the tree and pulls a large boulder away to free Walt and Paige. He calls Happy to check in. She is being held at gunpoint by the father who has just arrived to get his daughter. 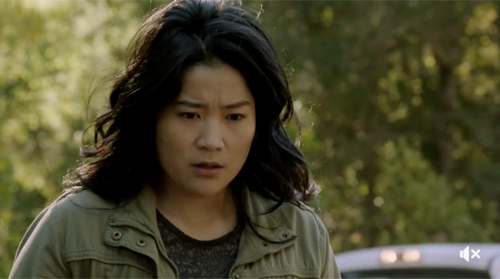 Happy tries to stall until Walt, Toby and Paige show up. Happy helps the daughter in the truck and then locks her in. Her dad cannot get in. He screams and threatens to kill them. The truck starts to roll towards the cliff. The dad goes crazy chasing the truck. Just in time, Happy’s winch takes hold and stops the truck from going over the cliff. Toby tells the father it was a bluff. The gang all head back to the warehouse. There is a box with a tie and a note from Collins. Cabe goes crazy, throwing something. Collins was in their home. This is the last straw. They all console Cabe. Sly tells him that he can take the stand and explain his feelings and his love for the country to the judge. She will believe him. There is hope.